Between holiday gift-giving and seasonal travel expenses, a lot of us have money on our minds this time of year. That makes it a great time to start talking finances with your children. Smart money management is a skill that will help your children throughout their lives, and can even improve their health. Annual surveys by the American Psychological Association consistently find that finances and money are top sources of stress for Americans, and chronic stress is associated with a host of problems from ulcers to heart disease to a weakened immune system. The good news: You can help your kids minimize future money stress by modeling good financial behavior now. Teach your children the difference between wants and needs. Food, shelter and clothing are necessary. A new scooter is not. Resist the urge to give into tantrums. Once you’ve said no to the candy or toys in the checkout aisle, stick to it. Include money talk in your everyday conversations. Children shouldn’t think that money is a taboo topic. 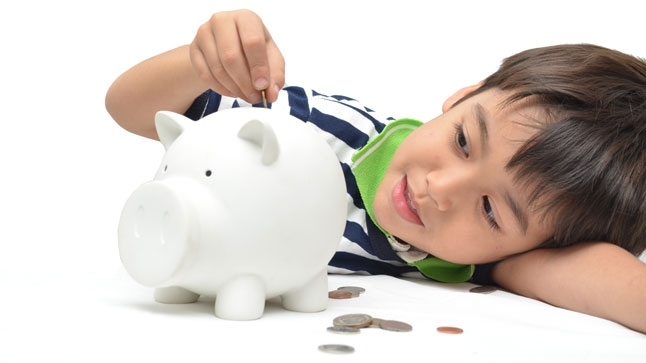 Answer your children’s money questions honestly in age-appropriate ways. Continue to discuss financial decisions openly as your children grow. Talk through purchases as you make them. Compare prices on different items at the grocery store, and explain why you’re choosing the store-brand yogurt instead of the name-brand variety. Discuss the financial trade-offs you make. You might not be getting that new phone now, but the money you save will help you take a summer vacation later. Start giving your child an allowance. Many financial experts recommend a piggy bank divided into four parts: spending, saving, investing and giving. Allow your child to spend some money right away on small trinkets or treats; save some for a bigger purchase; invest some in a bank account in your child’s name; and give some to a charitable cause of his or her choice. Discuss advertisements and commercials. Point out how ads are designed to tempt you – and aren’t always objective representations of a product or service. Experts recommend against tying allowance to everyday chores. But you might decide to pay your child a little extra for bigger jobs, such as cleaning the garage or raking the yard. As children get older, let them know you expect them to pay for some purchases, such as new shoes or movie tickets, with their own money. If they run out before their next allowance, don’t give them an advance. Missing movie night with their friends will help them learn the importance of saving and planning ahead. Start a bank account in your child’s name, and explain how to balance a budget. Consider giving your child a pre-paid debit card or credit card with a low credit limit so he or she can start learning how to charge wisely. Review the monthly statement together, explaining how interest rates and late fees work. If they fail to pay off the card one month, restrict use of the card until they’ve paid off the balance. Encourage your child to get a job when they’re old enough, but don’t let it come before schoolwork. Get more parenting tips from UCLA Health.